Mark Zirpel is talking about glass, a material he finds endlessly fascinating. That makes sense given that Zirpel heads the glass program in the UW School of Art + Art History + Design (SoA+AH+D) — a program he built from the ground up after joining the faculty in 2008 as the Dale Chihuly Endowed Chair of Glass. When Zirpel arrived, the Pacific Northwest was already a hub for glass. Since the 1970s, many glass artists have located in the Northwest thanks to the esteemed Pilchuck Glass School, established by UW alumnus Dale Chihuly (BA, 1965). But the University of Washington had no glass program. A group of philanthropic art collectors recognized the need and created the Chihuly Endowed Chair of Glass to support a faculty position and fund a new building with glass studios, faculty offices, and a gallery. With the recession, the new building was no longer a possibility. 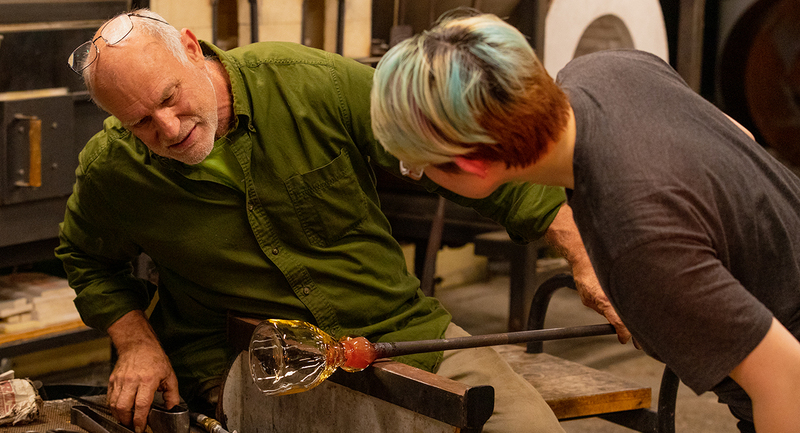 The School began offering glass classes at Pratt Fine Arts Center in Seattle’s Central District, and then in the UW’s Ceramic and Metal Arts (CMA) Building. With limited resources but an abundance of determination, Zirpel set out to acquire glass-working equipment on a shoestring budget. Zirpel had to prioritize since the four main techniques for working with glass require different equipment. Kilnforming, including techniques like fused and molded glass, uses kilns that reach 1500 degrees. Cold glass, usually a finishing technique for other processes, requires specialized saws, drills, and sanders for grinding and polishing. Flameworking involves heating and manipulating glass using an oxy-propane torch. Hot glass or blown glass requires a furnace that can melt glass into molten liquid and kilns that serve as annealers to slowly cool the material. As soon as you get glass out of the furnace it starts cooling off and becoming harder to work with, so you can’t be tentative. Ramping up facilities for kilnforming, cold glass, and flameworking took nearly four years and ingenuity, including building several kilns from scratch and negotiating an affordable supply of raw material. Adding a hot glass studio took another four years. 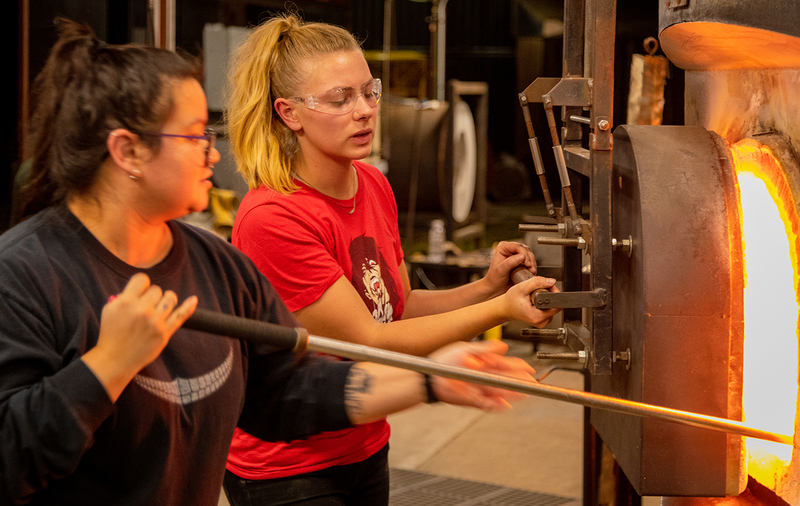 Sean O’Neill, instructional technician for the program and an experienced glassblower, was able to secure two electric furnaces donated by Glassybaby, and a bounty of used equipment from a glass studio that was closing. “The furnaces were very well used, so I took them down to the bones and reassembled them into one that would work well,” says O’Neill. Zirpel identified a covered area outside the CMA Building that could function as an area for hot glass, but there was still the matter of bringing electricity to the site. Hot glass requires enough power to run a furnace at sustained temperatures of 2000 degrees or more, while also powering pick-up ovens, kilns and other equipment. “To run electricity to the site was really costly,” says Zirpel. “It would have taken years of my budget just to get the power there.” To help the program over this final hurdle, College of Arts & Sciences Dean Robert Stacey dedicated College funds for the electrical work. With support from the Chihuly Endowment, Zirpel also hires visiting artists to teach for a quarter. This year he plans to have a glassblower and possibly a flameworker teach courses. “There are literally dozens if not hundreds of qualified artists to tap into around here,” he says. Some of those artists are alumni who first discovered glass as UW students. But even those who pursue unrelated careers are changed by working with glass. To learn how you can support the glass program, contact Merith Bennett at mab4@uw.edu or contribute online to the Dale Chihuly Endowed Chair of Glass.